Almost 5 months ago, November 8, 2014: A new plan had just been decided on and the layout moved out from the wall. The change of plan necessitated dismantling of the previously built Calico benchwork. 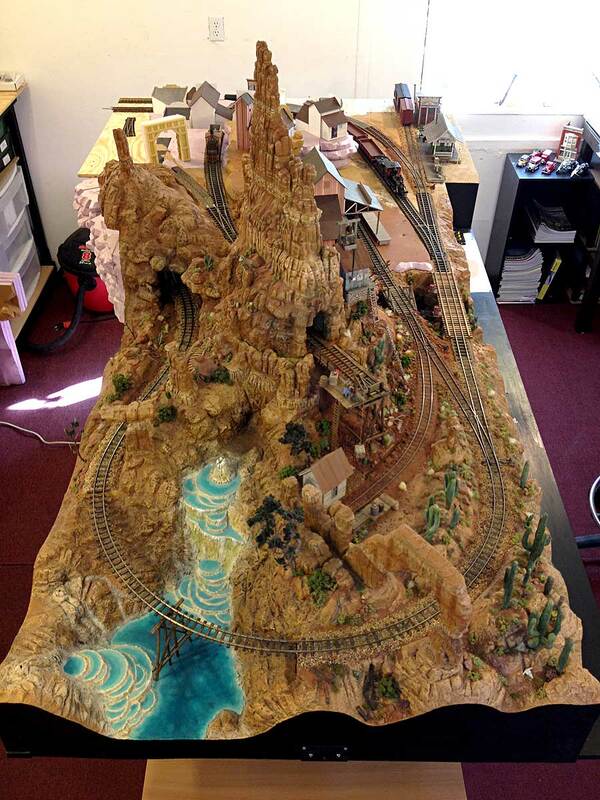 Today, March 28, 2015: The layout has now grown too large to capture in one overhead photo. 1"x4" pine box-girder benchwork is now in place for three new sections of the layout. Note how the layout base drops down in stair-step fashion to accommodate deep canyons in the Hanging Rock and Coyote Canyon sections. 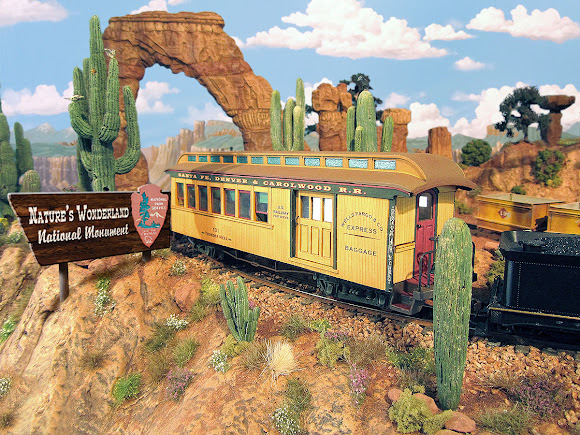 The floor of Coyote Canyon will be 24" or 96 scale feet below track level. The individual layout sections are joined together with 1/4" bolts and thumb-screws, allowing them to be separated should a move ever prove necessary. The lowered sections of Hanging Rock and Coyote Canyon are supported by sturdy metal shop shelves that also provide handy storage below the layout. 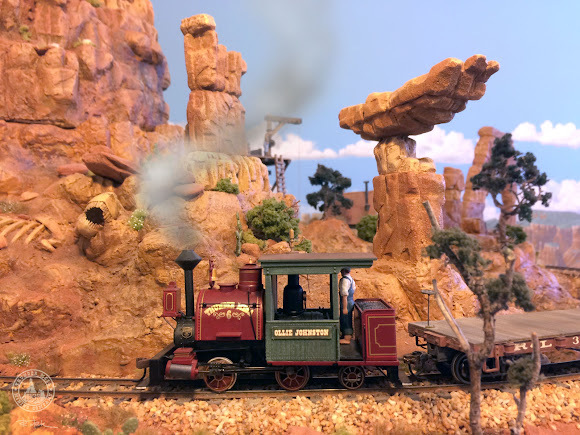 The San Lorenzo section creates a literal bridge between the Thunder Mesa "island" and the new parts of the layout, allowing for maintenance access via a duck-under. Next steps include sheathing the walls with 1/8" Masonite for the backdrop, building risers and sub-roadbed, and creating the sturdy shelf structure to support the portable Calico On18 layout on the Coyote Canyon section. 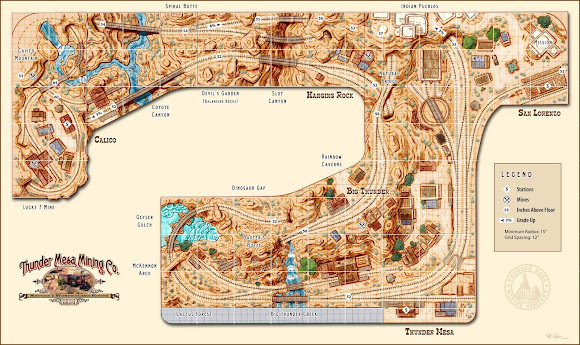 The current plan for Thunder Mesa shows the new shape of the layout and illustrates the labeled areas in the photos above. It's great to be moving ahead with the expansion and I'm really looking forward to seeing these new sections of the layout take shape. Right now trains can only shunt back and forth between Thunder Mesa and Rainbow Caverns so I'm determined to get some more track laid soon. 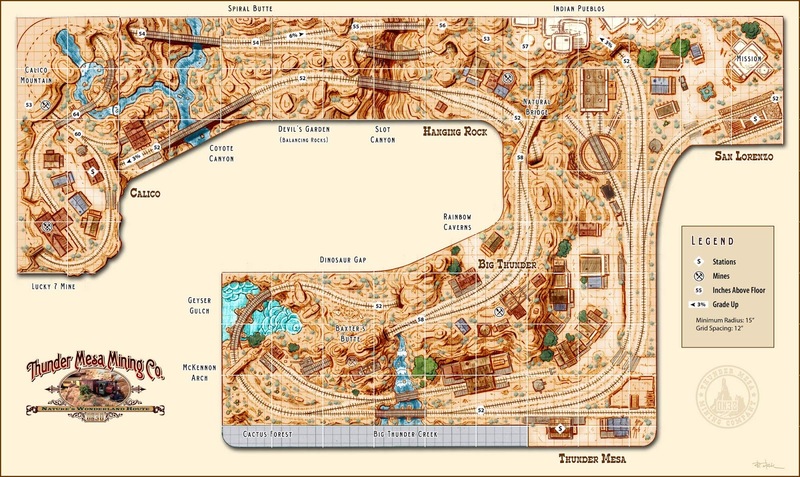 The San Lorenzo section will probably be tackled first, along with the turntable and engine service area. Lots to do! Thanks for checking in. Adios for now, amigos! This new 3' x 6' portable backdrop will provide improved viewing and photo opportunities on the layout, especially for scenes where no permanent backdrop is possible. 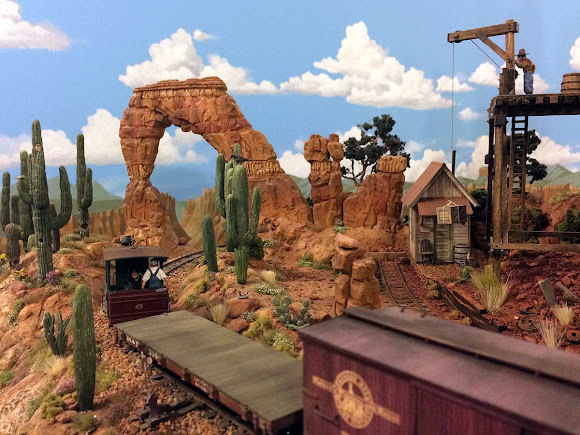 Eventually, the TMMC will be surrounded on three sides by a painted backdrop that will extend the illusion of Thunder Mesa country far beyond the actual boundaries of the layout. 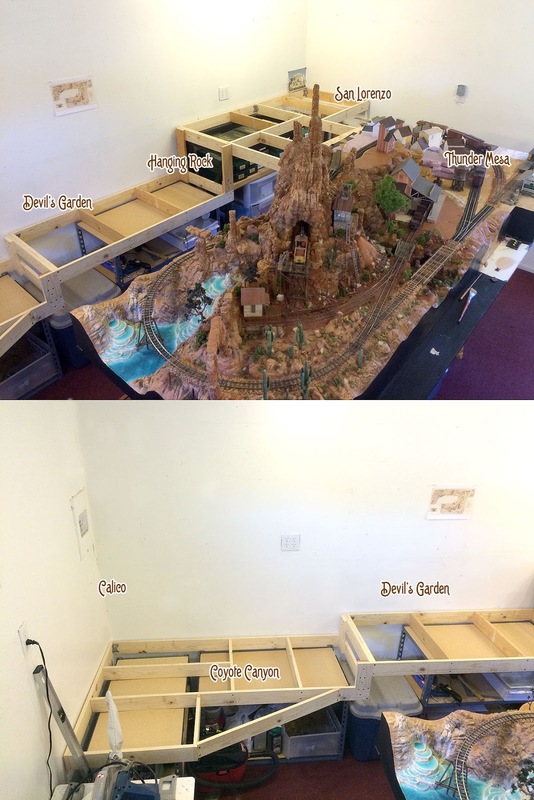 Unfortunately, even then, there will still be some viewing angles where no permanent backdrop is possible due to the layout sharing space with my studio and workshop. My solution was to create a portable, "roll-away" backdrop that can moved into position for operations or photos, and then shoved back into the layout aisle when not in use. Here's how it went together. The portable backdrop is basically a 3' x 6' sheet of 1/8" thick Masonite on an easel-like frame of 1x2s. 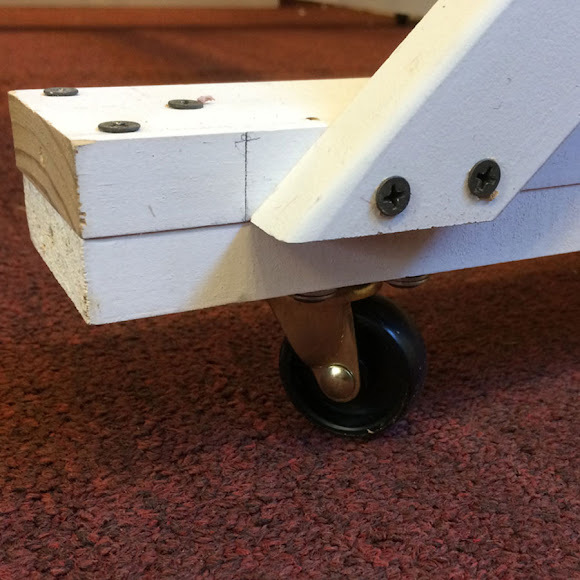 Angled braces provide strength and stability, and swiveling castors screwed to the 36" long 1x3 feet make it easy to roll around the layout. The lumber is primed MDF trim board and it's held together with 1 1/4" drywall screws. Loctite Powergrab construcion adhesive was applied to the frame uprights and the Masonite panel clamped in place to dry overnight. One of four swiveling castors that make it easy to move the backdrop. The three foot length of the feet is just right for fitting down the layout aisles. One of these days I'll get around to painting the frame flat black. For the base sky color, I chose Behr "Bliss Blue" interior flat latex paint. 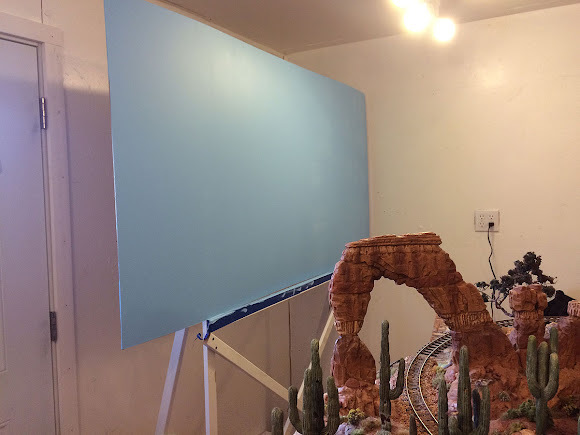 It provides a nice contrast with my red rock scenery and I will use it for all of the backdrop painting on the layout. The paint was applied with a roller, taking care to get the surface as smooth as possible. I painted the clouds using artists acrylics, primarily Titanium White and Paynes Grey. 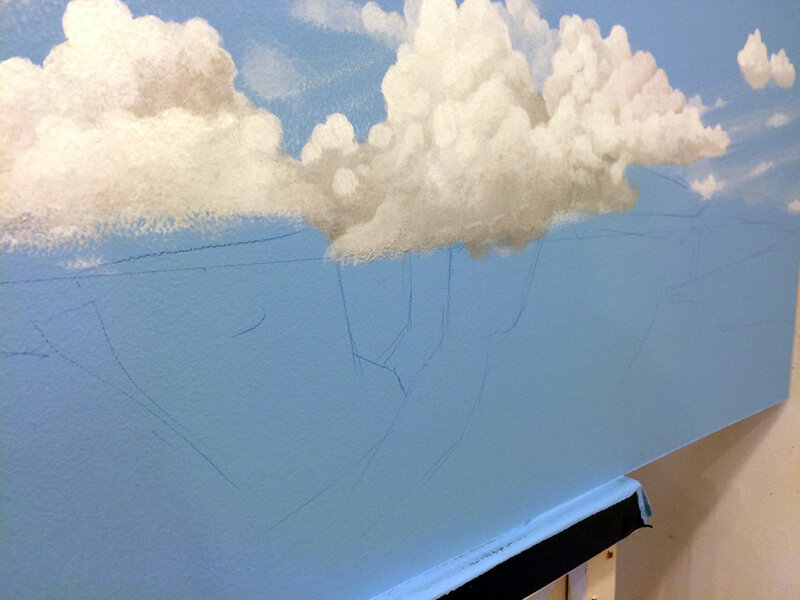 The paint was applied with a semi-stiff filbert brush in a dabbing motion to create the cloud shapes. In some areas, I scrubbed most of the paint off of the brush and used a swirling motion to dry-brush transparent wisps of cloud. The Paynes Grey was used sparingly, just a few drops mixed with white to create shadows and contours. 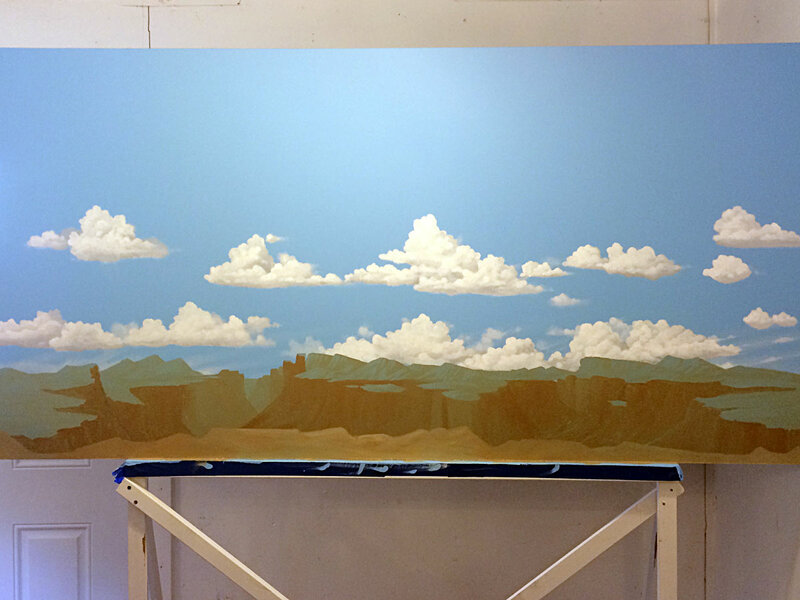 With clouds painted, I went back and sketched in the basic landforms of a canyon country scene. I admit the scene is entirely invented and I was going for something like a cross between Grand Canyon, Moab, and Sedona. 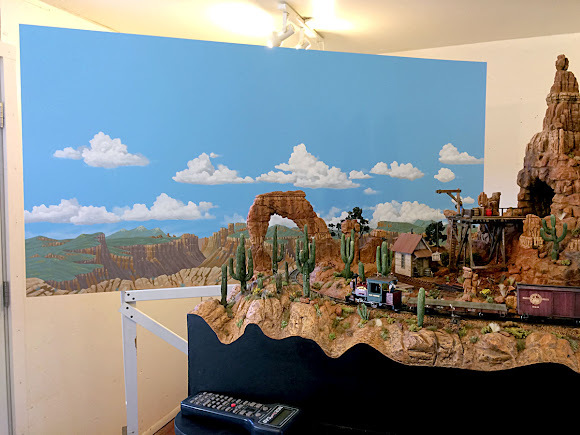 I paid special attention to where the horizon line would be and just how much of the painted scenery would be visible from different angles on the layout. 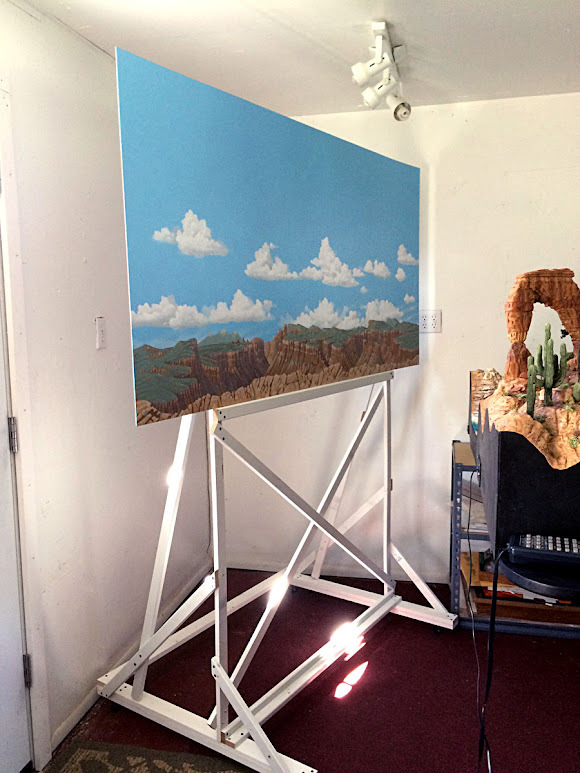 In all, the canyon scene only covers about the bottom 8 inches of the backdrop. Next, I blocked in the canyons and mesas with acrylics. It's a really good idea to mix up some large quantities of your basic colors in air tight containers ahead of time. 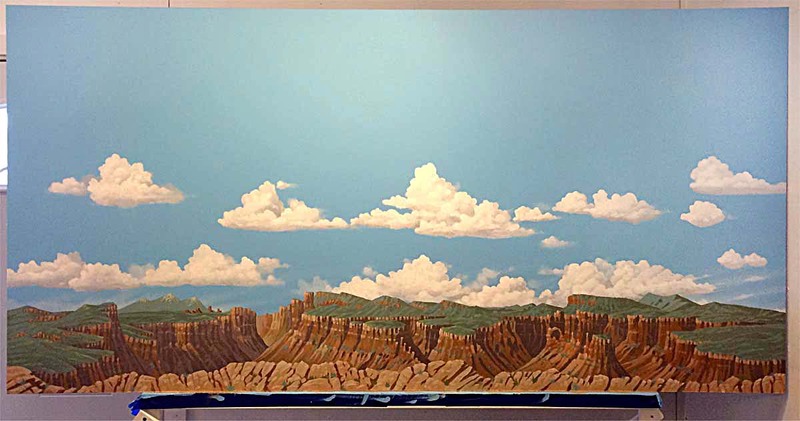 My basic colors where a medium raw sienna shade for the rocks, a darker shadow color, and a medium and darker blue-green for the mesa tops. 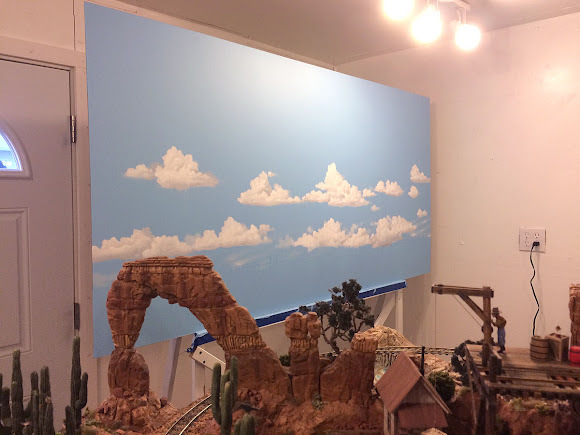 I used the same basic colors that I use for painting rock scenery on the layout, but added some of the blue sky color to grey them down a bit and to give the illusion of distance. The further away an object was, the more of the sky color that was mixed in. This is a simple way to create the illusion of distance and to keep the colors in harmony. And here is the completed backdrop after a couple days of painting. My goal was to match the character of Thunder Mesa's scenery as close as possible without going overboard on the detail. With the portable backdrop finished, now it's time to have some fun. With the backdrop moved into position to block my workbench, here's a view of Ambush Rock that was never possible before (at least not without Photoshop). Wheeled around to the other end of the layout, here it is backing up the depot scene. 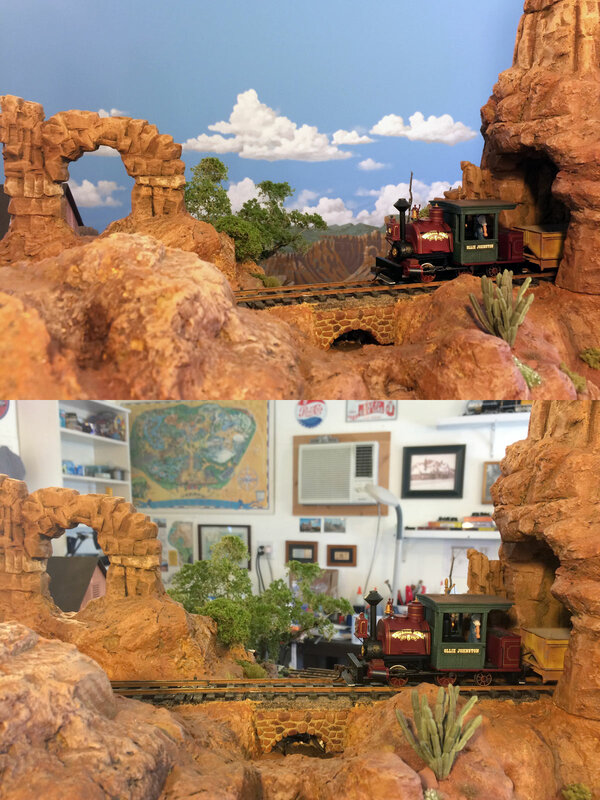 Here you can really see the difference a backdrop makes! The bottom image is from almost the exact same angle but the cluttered studio in the background completely destroys the illusion. Creating the portable backdrop was a fun project and a good "dry run" for the much bigger project of building a permanent backdrop around three walls of the studio. 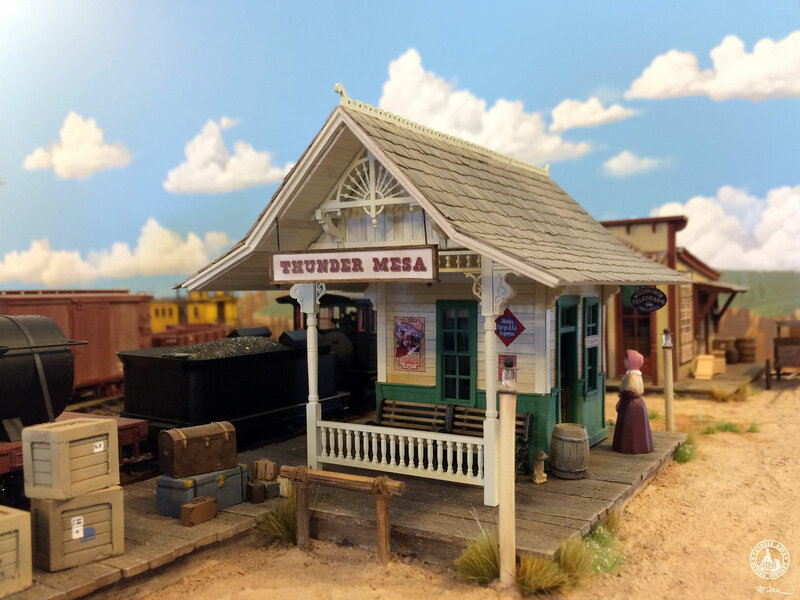 In the meantime, it will provide that much needed sense of place in the world of Thunder Mesa. Thanks for checking in, amigos. Adios for now! Number 6 steams toward McKennon Arch with a short freight in tow. The new portable backdrop adds a great sense of depth and distance to this scene.